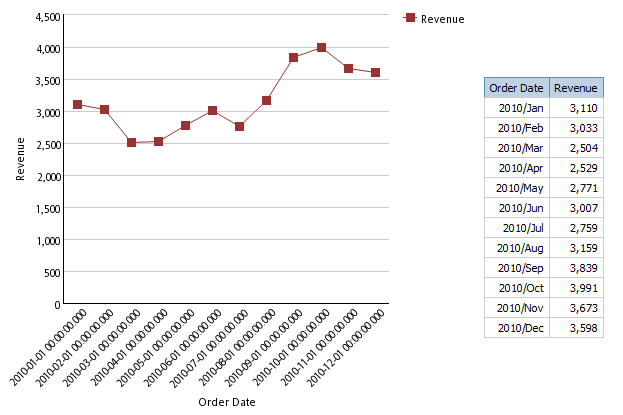 User wants to create a chart report that displays rolling 12 months revenue by for current year (In this example 2010). Although 2009 revenues should be used in calculating the rolling totals, the chart should display only 2010 months. Set the aggregate property of Revenue in the Base Query to "Total". Add a data item called [Dummy] with expression 'Dummy'. Add the data items from the base query to CY query. Create a new query called summary and add a join element. Join the queries based on the data item [Dummy]. 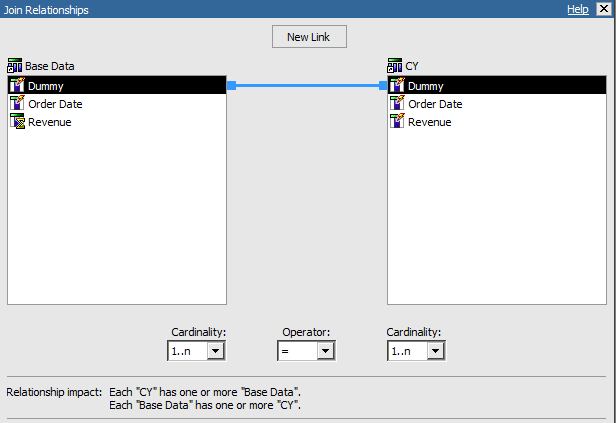 We are basically creating a cartesian product, but since cognos needs a join, we are using a dummy column. Add the [Date] from 'CY' query and revenue from "Base Data" Query. If you compare the tabular data and the base data above, you will see that each month's revenue includes that month and the previous 11 months. chém gióại tộc nhân cũng ngừng hợp tác, sau đó tứ đại thú tộc và tứ đại tộc nhân biến mất khỏi đại lục. - Viện trưởng, người nói bọn họ sẽ không bỏ qua cho tại hạ là vì sao? Nhạc Thành cất tiếng hỏi. - Bởi vì ngươi có thân thể Hoàng Long, huyết mạch đấu đế, đây là uy hiếp rất lớn đối với bọn họ, nhất định sẽ không bỏ qua cho ngươi. - Viện trưởng, tứ đại nhân tộc, tứ đại thú tộc là gì? Nhạc Thành tiếp tục hỏi, trong lòng hắn thầm suy nghĩ, Hắc Ám Thần điện nếu thật sự đến gây chuyện thì mình cũng không thể bỏ qua cho bọn họ. This is a totally different question. I have a prompt YrQtr which has data like 2009Q1 etc. I need the YrQtr limit to set default to current yearqtr+rolling 3 yrqtrs eg: 2013 Q3, 2013Q4, 2014Q1, 2014Q2. When I move to the next qtr it shuld automatically set to 2013Q4, 2014Q1,2014Q2,2014Q3 and so on. 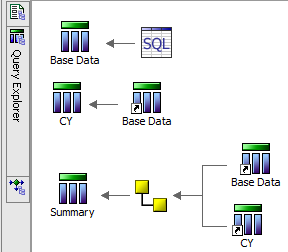 Any idea on how I can achieve this in report studio? How are you currently populating the value prompt. This should be query driven. You should have a date dimension for this to work properly and use appropriate filter in the prompt query to get the desired set of values. I am looking for your immediate attention , not sure this question is silly. We got around 48 rows for single date as values are captured for every 30 mins . The requirement is the graph should display as attached , however the timestamp values has to be hidden and only it should report "DATE" alone in X axis. I achieved till splitting it to "DATE" and "TIME" query items , however I needs to place it in chart to show the graph in the attached fashion . How can I make the graph undisturbed without showing time dimension . Sasikumar, There was no graph attached. Can you email me the expected output?